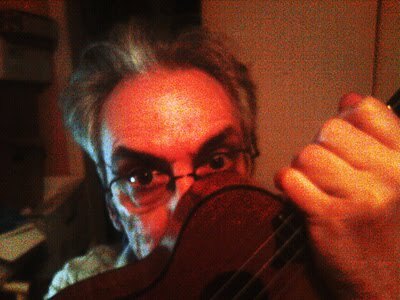 "Resolve to learn the ukulele in 2011. http://amzn.to/hT3nDd"
Better late than never: here's our list of links to all the Christmas music for ukulele you could possibly need. 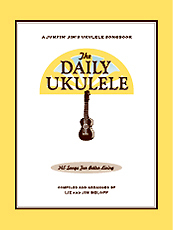 The Ukulelia Holiday Songbook. My old pal (and the guy who taught me my first tune on the uke) Tuba Heatherton's tribute to sunny California. Maybe he should have stayed in Islands where he was born. Rhode Island, that is. 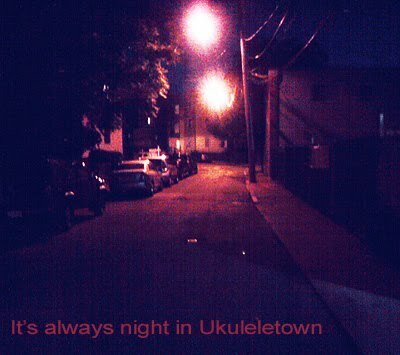 "The holiday season is once again upon us, the perfect time to share some ukulele cheer. And what better way to get your friends and family to pick up a uke and join the global strum-along than to give them the uplifting and inspiring story of the MIGHTY UKE. 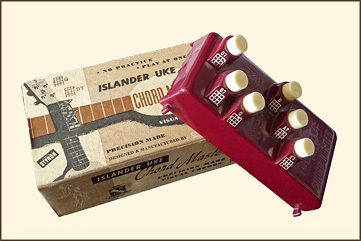 From now until Christmas Eve, if you buy any two items from mightyukemovie.com you will receive a MIGHTY UKE DVD free. But wait! That’s not all! Every purchaser of any DVD, Blu-ray, t-shirt or poster from our website will be automatically entered in a raffle to win one of three MIGHTY UKE Kala Concert Ukuleles to be given away on Christmas Day." The Utterly Butterly Ukulele project (TUBUP) runs around Great Britain helping people make their own ukulele from recyclable materials--in this case, margarine tubs. TUBUP puts on workshops in which the ukes are constructed and attendees learn how to play it and take part in a live performance. The ukuleles are constructed from an Utterly Butterly spread tub, fishing line strings, a piece of wood with screw eyes for tuning pegs. Here's a great photo gallery from a recent fundraising event in Cardiff, Wales in support of the BBC Children in Need program. The folks behind the Utterly Butterly brand seem to be pretty cool. For several years, they even had their own formation wing-walking team! 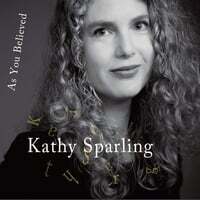 Kathy Sparling has a new CD out called As You Believed. She was kind enough to send us a copy to review and it's truly wonderful. I'm extra excited to be playing with a full band, including John Hanes on drums and Patrick Main on piano, along with the always wonderful Steven Strauss and Kurt Stevenson. Steven Strauss and Kurt Stevenson will kick things off with selections from their songbook of diverse popular melodies of bygone days. Dig it...If you're in New York (or Brooklyn) tomorrow evening, come out for a lovely evening of new music. 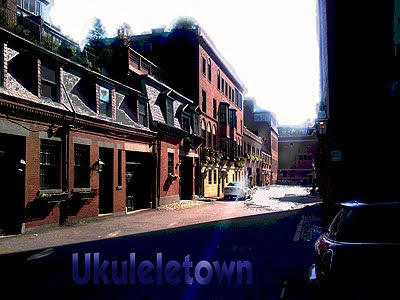 French ukers have had a great local blog to follow for some time: Ukulele.fr, formerly King David Ukulele Station. Here's a new one (for us at least). It's called Ukulele Boudoir. 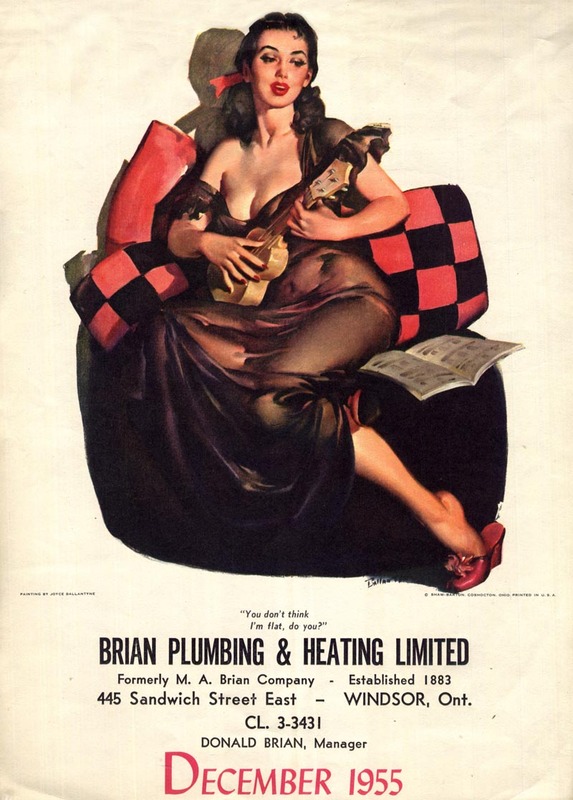 I particularly like their idea of publishing a monthly ukulele "pin up" computer desktop calendar. This month it's Craig Robertson's dream girl, the Le Domino. My friend Paula Wirth recently did the cover art for Megan Lynch's debut album, Songs the Brothers Warner Taught Me, a collection of tunes featured in vintage Warner Brothers cartoons. Today, Paula alerted me to Megan's ukulele rendition of the song Porky Pig plunks out at the beginning of the Daffy Duck classic "Drip-Along Daffy." Which finally gives me an excuse to give a plug for Megan's CD, which features Cheap Suit Serenaders Robert Armstrong and Tony Marcus. You can buy it here, and on several other sites listed here. And don't miss Paula's cover art. Hula Dreams is a triennial exhibition of hand painted ukuleles at Gallery East, 21 Burnie Street, Clovelly, Sydney, Australia. The exhibition features hand painted ukuleles by over fifty artists who are invited by curator, Carol Ruff (aka Coral Reef), to paint or make a ukulele in any way that moves their creative spirit. 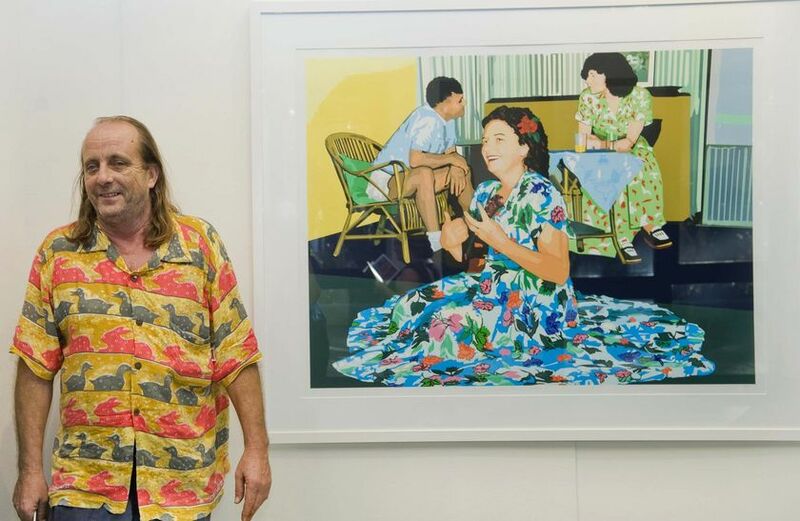 "Curator and Gallery East owner Carol Ruff said inventiveness and humour were key features of the Hula Dreams exhibition. 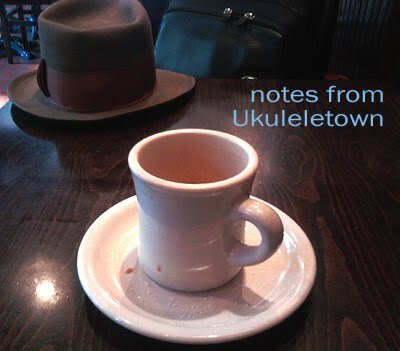 “There is a clock uke where time goes backwards, desert scenes, birds, The Beatles and a Leonard Cohen uke,” Ruff said." The current show runs November 5th to the 21st. Link to images from earlier shows here. Interview with Ruff here. Ashville, NC's resident ukulele goddess Ami Worthen was kind enough to send us a copy of Mad Tea Party's latest 7" vinyl and second Halloween-y tune, Rock 'n' Roll Ghoul. (It's a follow-up to last year's fab Zombie Boogie.) You can buy your copy here. The $10 price includes a digital download (so you can have it today for your party this weekend!). "The EP offers up 4 spooky selections for your rockin’ Halloween party. “Possessed,” a 60s-tinged psychedelic number, features Worthen’s wicked vocals and a demonic guitar solo from Mr. Cartwright. The furious screamer “Rock ‘n’ Roll Ghoul” expounds upon the theme of flesh-eating music critics while drivin’ rocker “Dr. Phibes” is an ode to the popular Vincent Price villain. 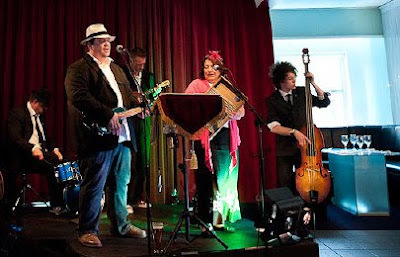 The duo close with the Hollywood Flames’ song “Frankenstein’s Den” with Cartwright on drum kit and Caroline Pond (Snake Oil Medicine Show) joining Worthen on doo-wop vocals." And here's the video of the title track. Poke around the Mad Tea Party site. Lots of ghoul, er, cool stuff to check out. There's a new documentary out about Stephin Merritt and The Magnetic Fields. "I just like the ukulele for its lack of rock associations. And I love the fact that you can bring it on a plane. Want to be the hero to millions of baritone uke players? Tab this one out for us. 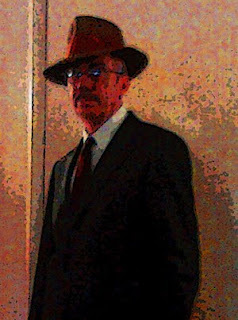 As Lightnin' Wells sez, "Have a nice day, everyone." "Light the candles, spike the eggnog and trim the tree... spin the dreidel and send out for Chinese." 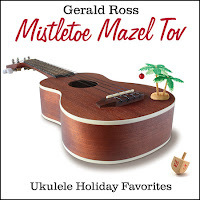 It's Mistletoe Mazel Tov, a new CD of ukulele holiday favorites from Ukulelia pal, Gerald Ross. Gerald calls this a "collection of holiday instrumental classics arranged for ukulele and steel guitar." He was kind enough to send us a reviewer's copy and we've been rockin' around the Christmas tree here for several days. My favorite so far is his arrangement of the achingly bittersweet Christmas Time is Here from "A Charlie Brown Christmas". You can order the CD from Gerald's site for only $18.95 and he'll also send you any disk in the Gerald Ross Catalog as a bonus - free of charge. 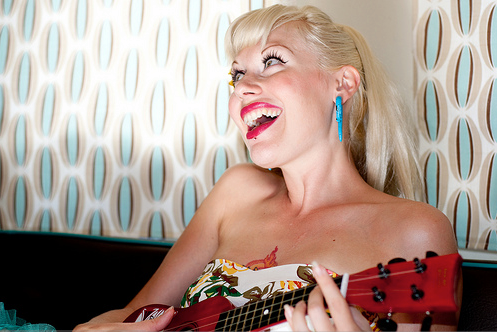 (If you don't have Ukulele Stomp -- and you should -- now's your chance.) Plus free shipping anywhere in the USA. Such a deal! But wait, there's more. At our humble, but brilliant suggestion, Gerald has posted the chords for his arrangement of Go Tell it on the Mountain online here. Here's the link to Gerald's online store. Get your copy today and give it a sov. Ingrid Michaelson has been known, at least for the past few years, as pop music’s primary ukulele practitioner. But, she laments, the group Train’s recent hit “Hey, Soul Sister” has quietly co-opted her status. Okay, all you Ducks and Beavers and such. Head over to Eugene, OR for Uketoberfest, Friday and Saturday, October 15 - 16. All kine workshops. Hang with Gerald Ross, James Hill, Jim D'Ville, Del Ray, and more! More info here. Ryan Gosling serenades Michelle Williams with You Always Hurt the One You Love on uke while she tap dances in the Sundance favorite Blue Valentine. For only $6,000 you can now get a ukulele made out of a gourd. Okay, it's made by the legendary and mysterious luthier Danny Ferrington, but do gourds "open up" over time? Or just become seedy? I kid. But mainly this uke is $6,000 because it's in Needless Markup's Christmas Catalog. The accompanying catalog blub sez that Ferrington "purposefully stays low-tech (no computers or Internet)". 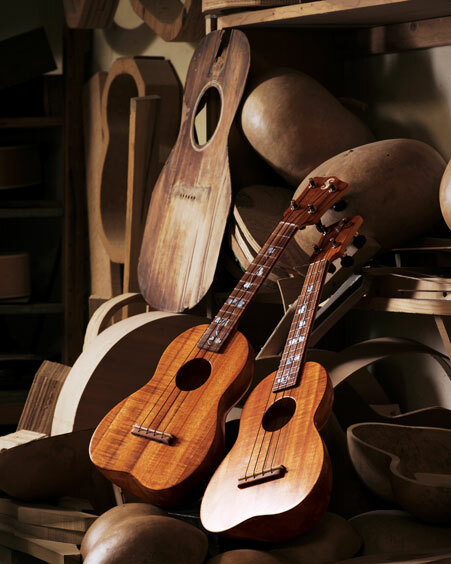 Apparently, so does Neiman Marcus's copywriter, who blithely asserts that the ukulele was "created in the Hawaiian islands by Micronesian immigrants in the 1870s". Here's a shortie of Roy Smeck imitating Bill "Bojangles" Robinson's famous stair routine on the uke. Notice how his fingers never leave his hand, and also how they never hit the strings! 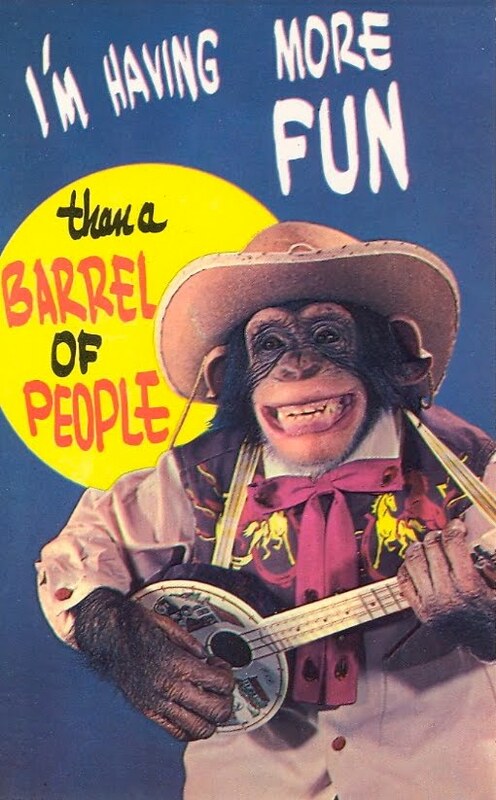 So the other day Dr. Nelson mentions that he has a vivid memory of Martin Mull playing the blues on a slide ukulele with a baby bottle back in the '70s. Here, then, is the happy by-product of Dr. Nelson's not having destroyed too many brain cells at Santa Cruz and the series of tubes that is the internets. Woot! Blended fresh, with ukulele goodness! Otto sez that although the Friday and Saturday event is sold out, Sunday August 22nd is free and open to the public. Best of all is the uke jam in the Tiki atrium near the waterfalls at 1pm Sunday! Plus 70 vendors of tiki-licious merch, including His Fezztastic Majesty, Tiki King. More info on the Tiki Oasis site. Zooey Deschanel rocks her K-Wave during the She & Him concert on Governor's Island NYC on July 4th. I've arranged with the good folks at Lamorinda music to lead an informal ukulele class this Saturday at their store. If you'll be in the East Bay area this Saturday, call the store and reserve a slot. I hear that at least 13 people have signed up so far. Hope to see you there! "Interested in learning the ukulele while playing some popular songs? Come join us Saturday, July 17th at 3PM for a great ukulele class for beginners or those wishing to brush up their skills. We will be learning together while getting introduced to some of the most popular music out there featuring the ukulele: Hey, Soul Sister by Train, I'm Yours by Jason Mraz, and even Israel Kamakawiwo'ole's rendition of Over the Rainbow. No experience required. Just come join us and have fun making music. How much? The class is free (though donations are accepted.) Don't have a ukulele? No problem! For a $5 deposit/rental fee we can loan you one for the duration of the lesson. If you like it, we'll even apply the $5 toward the purchase of the ukulele. 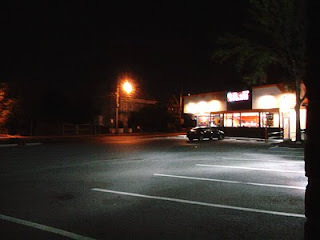 Call the store or drop by to sign up." "As a one-buck option to the Islander®, the Visual Chord Master® is a beautifully modern designed automatic chording device, allowing the beginner to charm his dulcinea in a button click. Fixed on the neck with two rubber bands, the Chord Master® is able to perform six chords : C, C7, F, G7, A7 and B7 with a standard C tuning. It seems however that the Islander® was supposed to be tuned in ADF#B, since the Chord Master® buttons are named D7, B7, G on the first row, and D, A7, E7 on the second." Antoine's site features a Chord Master Simulator which you can use to plunk out a whole raft of specially arranged tabs. Loads of trivia, historical info and reference images. Go Styro! The Grand-uncle of dem all. Legendary ukulele boosters Roy and Kathy Sakuma present the 40th (wow!) Ukulele Festival Hawaii Sunday, July 18, 2010 at the Kapiolani Park Bandstand in Waikiki. 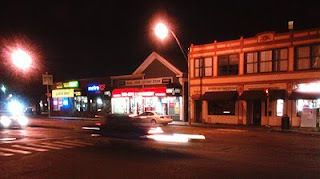 Picture this: Nazereth, PA. Home of the C.F. Martin & Co., makers of some of the finest ukuleles ever made. A world-renowned company arguably built on the back of the humble uke. 4th of July parade. The grand marshal is local girl made good and ukulele player Kate Micucci. And she leads a column of more than 400 instrumentalists all playing... Kazoos? 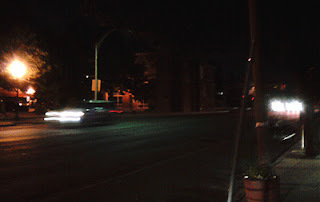 ..and, as the moon shines down on the tranquil waters of Boston Bay, I bid a fond farewell to...my heart. 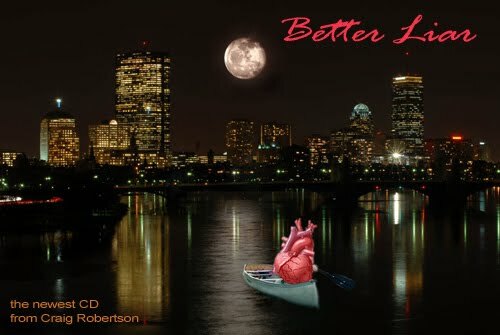 This is track number 6 on my newest CD "Better Liar". It features the swirling and ethereal harmonies of Amber and Jordan, otherwise known as Shiny and the Spoon. It's called "Narcissa". I’m halfway through my second cup of coffee at Lil’s Diner and Louie walks in. “You’re up awfully early.” I comment as he sits down on the chrome-and-red-leather barstool next to me. He just grunts as Lil pours him a cup of coffee. I don’t say nothin’, cause Louie generally will talk when he talks, and won’t when he won’t. With Cliff Edwards, Jimmy Durante, and Rudy Vallee (and ethnic stereotyping). So I went out this morning. I generally don't like mornings. 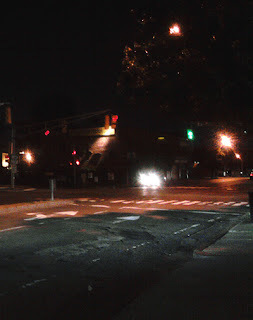 The light is too harsh and, y'know, bright? I'm headin' down the alley towards Carol's Coffee and I run into Louie walkin' his dog. The dog is a Boston Terrier named Asta. Louie tells me that I should make a point to stop down the Bar and Grill tonight because this guy named Sebi and some redhead from Scotland named Kelly are gonna be playin'. Louie says he heard them do the Script song "Man Who Can't Be Moved" and tears rolled down his face. This means a lot 'cuz Louie usually only cries when the horse he bets on stumbles. So I'm gonna go. Y'know. It's a musical instrument, it's not a metaphor for stunted creativity or dissociated social consciousness, a proletariat plunk of defiance, a universalist auditory embrace, a simplistic but humble nod to the musical historical discourse, an unpretentious prop for thesbians, an inroad into the lair of the youtubey universe or, even, a metamusical emblem. It's a musical instrument. make music on it. if you're not going to make music on it, go do something else.